In a show of support for the additive manufacturing community, global engineering technology firm Renishaw sponsored the internationally renowned, knowledge transfer event focused on production using additive layer-based technologies, the Additive Manufacturing and 3D Printing International Conference. This is organised by the University of Nottingham, and was held from 7-9 July, 2015. The Additive Manufacturing and 3D Printing International Conference has been running for almost a decade, and the event was one of the first dedicated to additive manufacturing. Renishaw’s additive manufacturing specialists attended the exhibition, sharing their wealth of knowledge with over 300 delegates from 19 countries. The first day of the event was dedicated to scientific advances in AM. Then the next two days provided a conference during which academic and industry speakers discussed industry topics, such as the future materials to be used in AM and applications of AM in the production and construction sectors. An exhibition including some of the highest profile names in additive manufacturing also ran in parallel. Separately, Les Hunt, Editor of DPA, Design Products and Applications, carries a report that a 3D-printed aircraft has been successfully launched from the bow of the Royal Navy vessel, HMS Mersey, and achieved a safe landing on a Dorset beach. 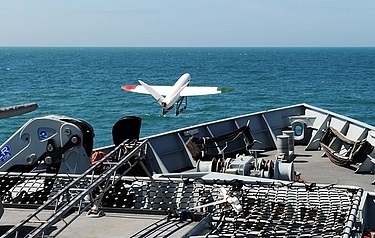 HMS Mersey provided the platform for the University of Southampton to test out its SULSA unmanned aerial vehicle (UAV). Weighing 3kg and measuring 1.5m the airframe was created on a 3D printer using laser sintered nylon. It was catapulted off HMS Mersey into the Wyke Regis Training Facility in Weymouth, before landing on Chesil Beach. The flight, which covered roughly 500m, lasted less than few minutes but demonstrated the potential use of small lightweight UAVs, which can be easily launched at sea, in a maritime environment. The aircraft carried a small video camera to record its flight, allowing the researchers to monitor the flight. It was back in 2011 that University of Southampton engineers initially designed, and flew project SULSA, the world’s first entirely ‘printed’ aircraft. With a wingspan of nearly 1.5m, the UAV being trialled has a cruise speed of 50kts (58mph) but can fly almost silently. Southampton alumnus, First Sea Lord Admiral Sir George Zambellas (Aeronautics, 1980) has championed the Navy’s involvement with Project Triangle, which resulted in the opportunity to provide a maritime platform for the test flight.